You could attend the 2019 AFP International Conference in San Antonio, TX for FREE as a Chamberlain Scholar! The AFP International Conference attracts approximately 4,000 development professionals from around the world to discuss, learn and share ideas on the latest trends and best practices in development. More than 150 educational sessions hosted by leading industry experts designed to serve the needs of entry-level to senior professionals and networking gatherings fill out the 3-day conference. In addition, the Conference Hall exhibits over 300 vendors demonstrating their products and services. Reconnect with friends and expand your network of fundraisers and industry vendors with unparalleled networking opportunities. 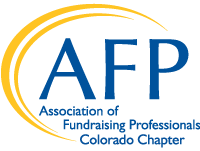 If you are a member of the AFP Colorado Chapter, employed as a fundraising professional (or if you are an executive director, at least 50% of your time is devoted to fundraising), new to the fundraising profession with three years or less of experience, and have never attended an AFP International Conference on Fundraising as a registered participant, you qualify to apply for the Chamberlain Scholarship! The scholarship pays your full conference fee to the 2019 AFP International Conference, March 31 - April 2nd in San Antonio (less a $10 administrative fee which is required of the scholarship recipient). The AFP Colorado Chapter will provide a $500 travel stipend to offset travel and hotel expenses (if needed). Additional information you would like to share with the selection committee. Use these links to download the Chamberlain Scholarship form in your preferred format. Deadline for submission in end of business October 19, 2018.